Speak to the Fairy Queen at Fairy Resistance HQ. Upon gaining the requirements for the quest, use a Fairy Ring and you will be redirected to the Sparse Plane and met by Fairy Very Wise. Talk to her and she will tell you of the situation before offering to take you to the Fairy Resistance HQ. Head east and talk to the Fairy Queen. She will briefly explain the situation before passing you on to the Tooth Fairy, the commander of attack. The Tooth Fairy will explain that they have developed a secret weapon under the acronym FTM - Fairy Tooth Magic! Turn on the nearby projector and you will be shown a briefing and given an introduction to FTM. She will explain that they made a breakthrough which allows them, by magically enchanting a farming patch, to grow creatures that are identical to their original host. She will then explain that the Fairy Godfather has mobilised three ork generals to aid him. Turn on the projector again to view another briefing. This will explain that ork grunts are being recruited through a rift and the Godfather's army is swelling and has embarked on a campaign of shock and ork, causing problems throughout Zanaris. The godfather also has a protective shield that needs breaking if he is to be defeated. Before anything else, the Tooth Fairy wants you to head to her house and fetch her Wand. The door is locked, so you will need to create a Tooth Extractor to enter. Head north and you will find several spawns of Hammers and Secateurs. Pick up one of each and use them with each other to create a Tooth Extractor. Head back to Zanaris and make your way to the Tooth Fairy's house in the north-west corner of the city, near to the bank. Use the Tooth Extractor with the door to unlock it. Talk to Gnarly and he will state that he won't give you the Wand. An interface will appear in the top-left of your screen indicating the mood that Gnarly is in. Make three statements that are compliments and his mood will change to 'Yip Yap'. He will then state that he wants some Milk. There is a General Store to the south where you can buy a Bucket for 2gp. This can then be filled by milking a Dairy Cow which is located east of the grain field. With the Bucket of Milk, talk to Gnarly again and he will drink it. Close your eyes and Gnarly will fetch the stick, before requesting that you pick him up and carry him to the Tooth Fairy, via Fairy Rings AIR - DLR - DJQ - AJS, with the stick in his mouth. Talk to the Tooth Fairy and she will give you a refresher on the previous mission briefings, before requesting that you view the next one through the projector. You will need to fetch a bad tooth from each of the three ork generals to grow into replicas of them. The Tooth Fairy will explain that you will need a magic tooth inserted into your mouth to access some remote fairy ring locations, a procedure carried out by TEEF - Tooth Extraction Expert Fairies. Stand on the yellow flowers to the south and perform the Wave emote to activate the procedure, which is censored for the squeamish. Once the ordeal is over, you will be given a Dossier with information about the location of the teeth you want, as well as a background on the Fairy Godfather. The teeth can be obtained from the generals in any order. The stated order is simply alphabetical. Bre'egth can be found near to the windmill to the east of Zanaris bank. Talk to her and she'll say that K'Chunk knocked her tooth out and has it, but the ork grunts dealt with him, so the location is unknown. Talk to one of the nearby Orks and they will say that they sent K'Chunk through the Fairy Rings, but Fairy Fixit got in the way. 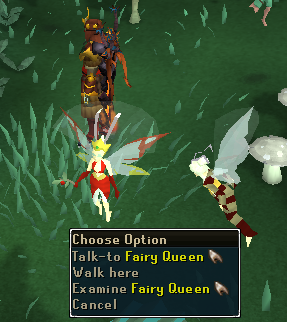 Head to Fairy Fixit, next to the Zanaris Fairy Ring, and talk to her about what happened. 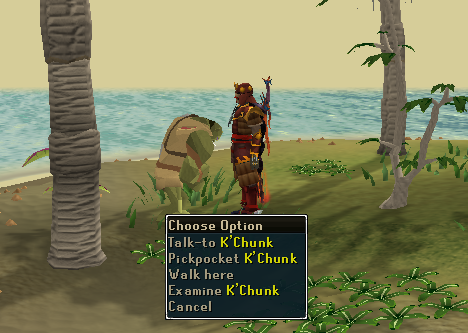 She will tell you that he went to location DIP, so use the Fairy Ring and enter this code to find K'Chunk. Talk to him and he'll tell you that he keeps the tooth in his leggy pouch. Pickpocket K'Chunk and you'll find Bre'egeth's tooth. Gromblod can be found in the Enchanted Valley, a beautiful area accessed via the Fairy Ring code BKQ. Talk to either the Wood Dryad or a Centaur and they'll tell you that the general is causing a nuisance because he's hungry. Talk to Gromblod and state that you can help. He'll explain that what he'd really like is a Mango. Talk to the Wood Dryad and he'll tell you the location of a Mango Tree, Fairy Ring code CLR, and will also cast a spell to enable you to get there. 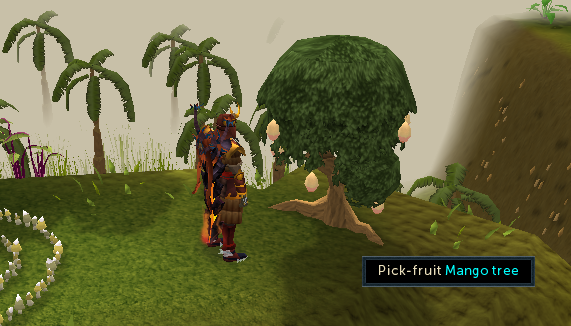 Pick a Mango from the tree next to the CLR Fairy Ring before heading back to Gromblod. Give him the Mango and he'll eat it, but he'll dislodge a tooth because of the stone, so will throw it away. Head south and pick up the Mango from the floor and proceed to extract the tooth by using the Mango with the Tooth Extractor. Shredflesh is in a cave near Gu'Tanoth which can be accessed via the Fairy Ring code ALP. Talk to him and he'll explain that he's looking for herbs to stop his ickle little teef from hurting (aww, don't you just feel sorry for him?). Ask if you can help with his problem, then if they're really hurting and finally state that you're a dentist and can help. Showing him the Tooth Extractor will be proof that you really are a dentist, but you'll need to convince him because, as we all know, 'toof docs is evil'. You'll now have to choose three chat options to convince him that it won't be very painful, moving the slider appearing on your screen into the 'Convinced' position, in a similar way to the conversation with Gnarly. Once he's convinced, use the Tooth Extractor with him to remove the tooth. With the three teeth, head back to the Tooth Fairy and she'll explain that you should engage the Fairy Godfather with 'considerable prejudice', but under no circumstances 'extreme prejudice' because that simply isn't the fairy-way. It's then into another briefing session by looking at the projector. This briefing will explain that you will be given the #ZFW1 combat apparatus, the Fairy Wand, when you head into battle. This will be able to heal any creatures you have grown from the General's teeth as well as the plants they grow from if they become damaged before reaching maturity. At the end of the briefing, you will be given the Fairy Wand as well as the location of the ork rift: Fairy Ring codes BIR - DIP - CLR - ALP, entered in order. Now is time to prepare for battle! It's suggested that you bring Melee armour and a weapon as well as a Super Set, Prayer Potions and an inventory of good food for the battle. Also remember to bring the three teeth and the Fairy Wand. There is no need to bring a Lunar or Dramen Staff because the Wand will perform the same function. Head to the ork rift and look through the fairy tree to overhear a conversation between the Fairy Godfather and his minions. At the end of this, the Tooth Fairy will appear to give you a final briefing and protection. The briefing will tell you to plant the ork teeth in the farming patches so they can grow into tooth creature allies. Having done this, defeat the ork generals and grunts. Once the generals have been killed and the tooth creature allies have destroyed the Godfather's shield, you can finish him off. If you die during the battle, your gravestone will appear next to the Zanaris Fairy Ring. Squeeze past the fairy tree to start the battle. Head to the right of the entrance and plant a tooth in each of the Farming Patches. You will be attacked by the three level 150 Generals as well as the level 138 Godfather and a number of level 54 minions. By careful manoeuvring, it is possible to move yourself so only a couple of these can attack you at once, however they are crafty creatures and will soon move into positions to attack you again. Keep an eye on the three farming patches and equip the Wand, then heal them if the need arises. Until these are grown, you will only have a major impact on the minions since the Generals will heal and the Godfather still has his shield up. Once the teeth have grown, get them to attack the Generals by choosing the 'Follow-me' and 'Fight!' right-click options until they do as you want. Be sure to keep their health up by equipping the Wand and healing them since if they die they will need to grow again. If you find yourself low on food, it is possible to step out of the area and let the tooth allies continue fighting, re-entering simply to keep their health up. When all the generals and minions are dead, it's time to defeat the Godfather. Ensure that each tooth ally is at full health, then engage in combat! Keep the health of all the tooth allies up, and once the Godfather's shield has been removed you can choose to join the battle yourself or stick to a healer role. 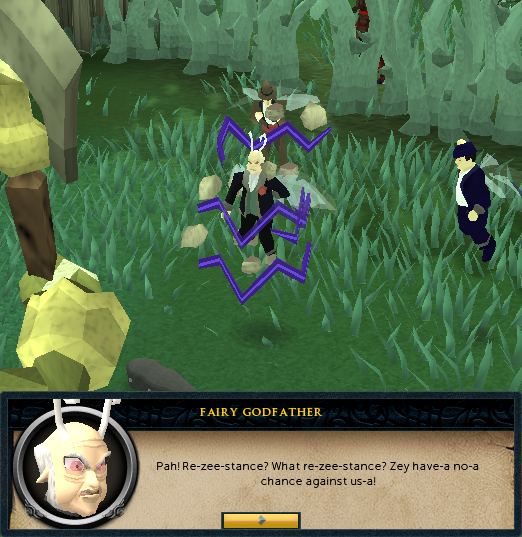 The Godfather will quickly die and be sucked into the rift, at which point the Fairy Queen will appear along with a pair of Fairy Stitchers who will use their stitching skills to close it up. Unfortunately, the Godfather's evil energy is too much for it to take and the rift will explode, leaving a desolate burning area behind. The, now cursed, tooth allies will turn on you and the fairies will teleport you out to safety. The conversation will continue and you'll be provided your first set of rewards before being offered a teleport to Martin the Master Gardener. Talk to Martin to complete the quest! After completing the quest, it is possible to obtain a number of extra rewards by talking to NPCs and doing some more exploring! Kebbit Tooth - Capture Sabretooth Kebbits using deadfall traps in the Trollweiss Hunter Area; requires a Knife and Logs which can be cut from nearby trees with a Hatchet. Monkey Dentures - Bought for 10gp from Tutab's Magical Market on Ape Atoll. Suqah Tooth - Dropped by Suqah on Lunar Isle. Old Tooth - Dig at the Dig Site by using either a Trowel or Rock Pick with the soil in an excavation area. Level 1 digs require Leather Gloves, Leather Boots and a Trowel. Level 2 digs require a Rock Pick. Level 3 digs require a Trowel, Specimen Jar and Specimen Brush. All items can be found around the Dig Site by talking to Examiners, searching cupboards in the Exam Centre and stealing from Digsite Workmen. It may take a while to find a tooth, so don't lose hope if it doesn't appear instantly, although it may be worth trying a different level dig. Human Child's Tooth - Search the Bunkbed in Philop's room of Gertrude's house to the west of Varrock. 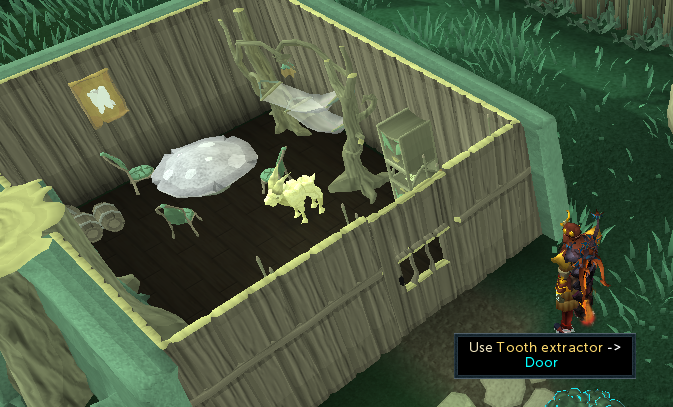 Like other pets, it can be stored in the Menagerie in your POH. For it to grow into adulthood, you will need to feed it Milk or Chocolate Milk. Feeding the latter will cause the adult version to be decayed rather than healthy. You can sell various teeth that you find to the Tooth Fairy. 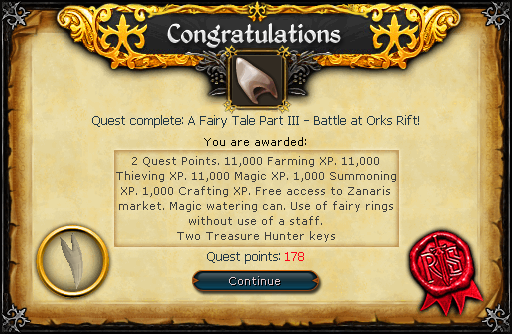 You can return to the ork rift via Fairy Ring code ALP and fight level 108 cursed Ivory Creatures. Talk to Martin the Master Gardener and he will mention that the helpers who watch over each of the farming patches will be willing to keep them weeded for you. Talk to the helpers next to farming patches to enable and disable this - by default they will not weed your patches. Next to the CLR Fairy Ring is a Hollow Log which needs clearing. Once this has been done, it can be climbed through when you are holding a Small Ninja Monkey Geegree. It is possible to clear the log and gain this shortcut before completing the quest. There are two additional rewards that can be gained through the Fairy Ring location ALP. To the north of the Fairy Ring are some rocks which can be cleared from the cavern wall with a Pickaxe. This will open up a tunnel which leads to a location on the coast south of Jiggig. With level 85 Herblore, there is a Mushroom Patch to the east of the Fairy Ring which can be searched to obtain a haul of herbs and herb seeds. You will need 24 empty inventory spaces to take them. The haul consists of: 7 Grimy Ranarr, 7 Grimy Dwarf Weed, 7 Grimy Cadantine, 2 Ranarr Seeds, 2 Dwarf Weed Seeds, 3 Cadantine Seeds. There are two additional rewards that can be gained through the Fairy Ring location DIP. The bridge from the island with K'Chunk to Mos Le'Harmless can be repaired. There are two sections that need repairing, requiring 8 ordinary Planks and 16 Nails between them, as well as a Hammer to fix the Planks in position. The first section can be accessed directly from the DIP Fairy Ring, while the other section can only be reached through a Portal on the Mos Le'Harmless side. 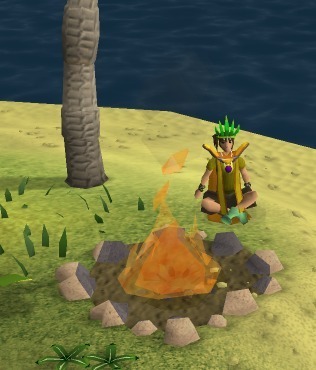 With level 85 Firemaking, it is possible to light an everlasting campfire next to K'Chunk. This requires 8 Willow Logs, plus a Tinderbox, and provides 10,000 Firemaking experience.